Zachary Levi wants to see Shazam! square off with some of the strongest characters in the DC universe in the future. If the actor gets his way, he'll eventually get the chance to duke it out with Shazam's arch nemesis Black Adam as well as the Man of Steel himself, Superman. Even though Zachary Levi has hopes that these things could happen in the future, he's content to just focus on one movie for now. Warner Bros. bought a big showing for Shazam to San Diego Comic-Con this year, showing off the Shazam Comic-Con trailer and bringing Zachary Levi and other members of the cast to the event. During an interview after the panel, Levi was asked who else he would like to see the hero fight down the road and he dropped a couple of big names. Here's what he had to say. "I would love for Shazam and Black Adam to go head to head, I would love that. And I would love for like Shazam and Superman to go head to head because in the comic books those have been some iconic fights. You know there's so many cool things we could with the character, but one movie at a time, I'm just so stoked that we're here right now. That we made the movie, we got through that winter in Toronto. These talented young fools are just going to continue to take over the world and I'm just going to hang onto their coattails." Dwayne Johnson has been attached to play Black Adam for years now and he was originally supposed to be in this first Shazam movie as the main villain. Instead, it's going to be Mark Strong's Dr. Sivana this time around. 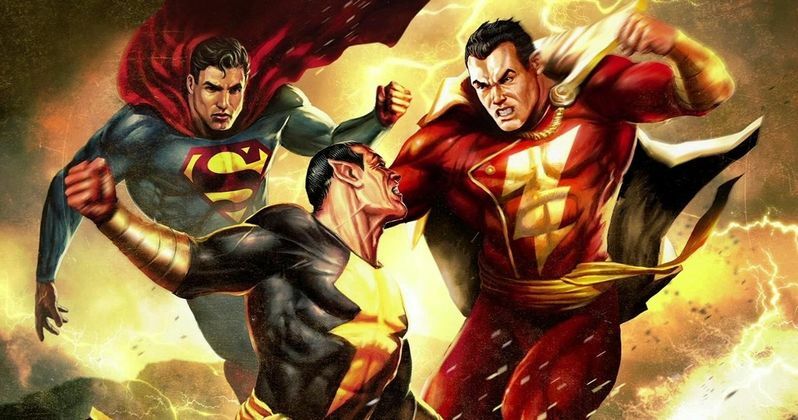 But Johnson is still attached to Black Adam and is developing a solo movie for the character with Warner Bros., which could help set up their eventual brawl. As for Superman, it's been teased multiple times by Henry Cavill and The Rock that the last son of Krypton and Black Adam may go toe-to-toe at some point. The idea of Shazam and Superman squaring off is equally tempting. In case you aren't familiar, Shazam is actually a 14-year-old boy named Billy Batson, played by Asher Angel in the movie, who is gifted powers by a mystical wizard, played by Djimon Hounsou. By uttering the hero's namesake, the boy transforms into a tremendously powerful hero, on par with Superman. The cast for the movie also includes Jack Dylan Grazer, Grace Fulton, Ross Butler, Adam Brody, and Michelle Borth. At the present time, it's not clear when Henry Cavill's Superman will be back in the DC movie universe. Man of Steel 2 has been floated for quite some time but hasn't yet materialized. As for the Black Adam movie, Dwayne Johnson is very busy, though, it's possible the movie could begin filming next year. As for when we could see either of them square off with Shazam? Much of that will probably depend on how well the movie does when it arrives in theaters on April 5, 2019. This news comes to us courtesy of Comicbook.com.